2. Season the fillets with salt & pepper. 3. Steam and drain the spinach, keep it warm. 5. When it boils, reduce heat and simmer 10 minutes, then add the lime juice. 6. Add the ginger and jalapeño and continue to simmer. 7. Heat an oven-proof skillet on high and add the olive oil. 8. When oil is shimmering, add the seasoned fish, flat side down, and pan-sear for 4 minutes. 9. Transfer skillet to oven and cook for 3 minutes more, do not turn the fillets. 10. Divide the spinach among 2 deep bowls. 11. Carefully remove the fish to a plate and keep warm. 12. Return skillet to stove top and heat on high. 13. De-glaze pan with white wine and then add the ginger-lime broth. 14. Bring to a boil and then pour over the spinach. 15. 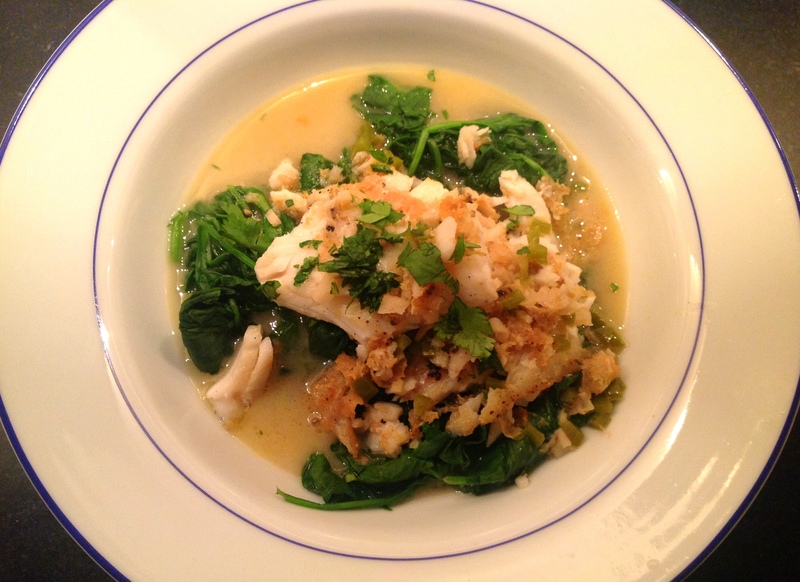 Gently place the cod fillets on the spinach and top off with the cilantro. Serve with a crusty, warmed baguette and Sauvignon Blanc.